Adventureland, and in particular the skippers around the land, have a long history with chicken and chicken-like food. 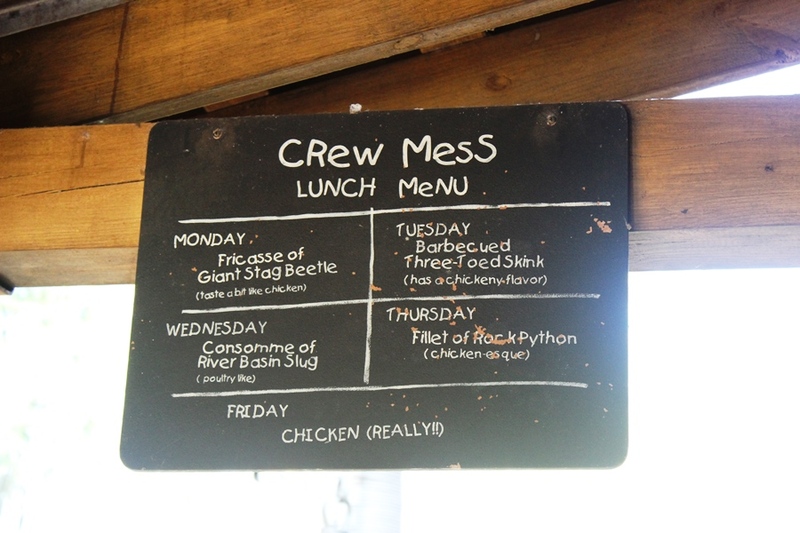 The lunch menu for the crew mess hall at the Jungle Cruise lists all sorts of tasty delicacies that have a recurring flavor profile. From the Barbecued Three-Toed Skink to the Fillet of Rock Python, everything has a distinctly chicken taste to it. Across the way at the Skipper Canteen, they take their chicken seriously, although not that seriously, when they offer up the real deal in the form of their “Tastes like Chicken” – Because it is! 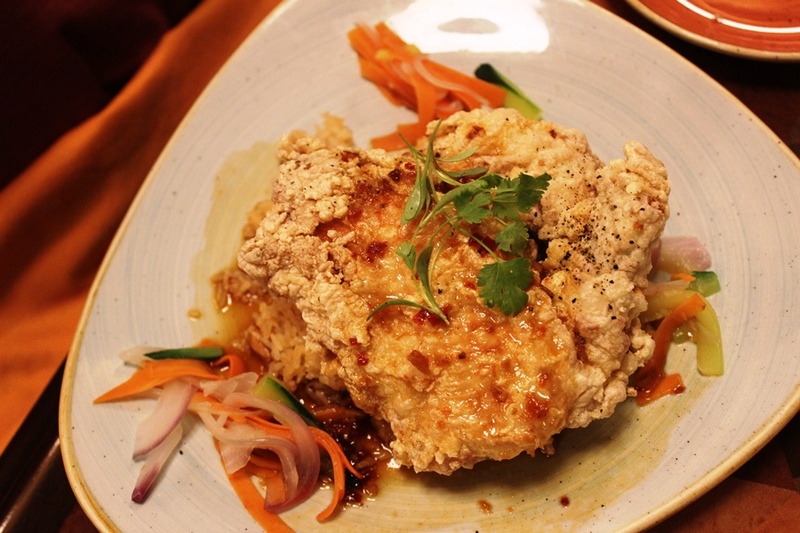 The dish features a crispy fried chicken that is drizzled with a chili glaze and comes paired with citrus and ginger-scented rice and seasonal vegetables. I’m not going to lie, even looking at the picture now is making me hungry. If presentation is everything, then there is no doubt that this photograph worthy entrée is definitely worth ordering. Of course, no one wants to eat a picture, so what does the Tastes like Chicken actually taste like? Chicken, of course! But this isn’t your colonel’s fried chicken. The Tastes like Chicken passes my most critical test when it comes to fried chicken, and that is the breading on the chicken. It is super crunchy and does a superb job of keeping the chicken breast juicy while not becoming mushy or soggy itself. The breading isn’t over seasoned, likely just some salt and pepper, and it lets the chicken and glaze shine through. Speaking of the glaze, the sweet and spicy chili glaze does a great job of providing some heat to the chicken. It’s the kind of heat that builds throughout the meal, but doesn’t leave you in a flop sweat or is hot just for the sake of being hot, so it is definitely family-friendly. When paired with a bite of chicken the orange and ginger-scented rice will remind you of Chinese fare, such as a dish like orange chicken, while not being too on the nose. On its own however, the rice does a good job of being flavorful, but not overpowering. If you happen to pick up some of the glaze with the rice, then that bite will be so much the better for you. The seasonal vegetables have everything that you would expect, from carrots to something green, and even some red onion to complete the ensemble. They are thinly sliced and add an element of something fresh to the meal while not pushing themselves to the forefront of each bite. 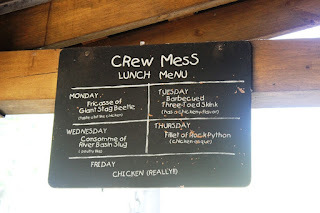 Friday is always chicken day in the Jungle Cruise’s crew mess, but no matter what day you visit the Skipper Canteen, chicken is always on the menu. The Tastes like Chicken – Because it is! is a dish that is filled with familiar and tried and true flavors. It leaves nothing to be desired from its preparation to its presentation, which is saying something when we consider how bland or generic chicken can be. This is a delicious meal that I would definitely order again. And it is certainly better than the Consomme of River Basin Slug the skippers have to eat on Wednesdays!